Art: something that is created with imagination and skill and that is beautiful or that expresses important ideas or feelings (Merriam-Webster). What is art? There’s the definition. I feel certain that you can point to something that you believe to be art, or artistic, or artful. But you must admit, it can be illusive. 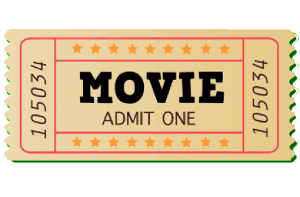 Millions of people may spend billions of dollars to see an action movie. It would be hard to say that it wasn’t created with imagination or skill, or that it didn’t express important ideas or feelings. But is it art? Just because you can’t take your eyes off of a thing or you can’t stop talking about it, is it art? Just because a video is trending, or has gone viral, or has exploded the twitter-verse, is it art, or just a train wreck, a spectacle; random explosions and ticking time bombs that surprise and startle? And if something has demanded that fleeting bit of global attention, does that mean it has value? Is it important? We already know it won’t last. Somewhere in the deep hidden meanings, there is the idea that for something to be art, the artist must sacrifice and suffer; a Van Gogh lopping off an ear. Inner thoughts exposed, and in that exposure, torment, self-doubt, anxiety, and fear. Does that make the result art? Is it a requirement? When the work is revealed, then comes the critique. The critic, the viewer, wields the flames out of which the suffering rises. But what of the critic? What risk do they bear? They sit back in their comfy chair and view the hours, days, months, or years of tireless labor, and in a moment they expound their self-imposed lofty opinion and accept or dismiss, with no loss or gain to them. I, however, believe there is something to be gained as a viewer. This is no risk as a critic, and let’s face it, we are all critics. But when art achieves its goal of expression, it enlightens us in some way. It completes incomplete thoughts, or shows us a new angle, or highlights something we have always been opposed to. We cannot alleviate the suffering of the artist, if indeed they did suffer. But we can receive and comprehend the message. And personally, that is what I believe all art is; the dissemination of feelings and thoughts, packaged in a compelling manner. 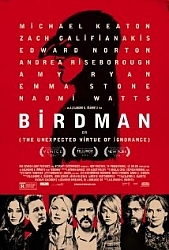 I am inclined to call Birdman filmic art, though you may not agree. As expressed, art is open to interpretation. But I will say it is a marvelous work that in a very compelling manner expresses several messages. The story has many levels. A washed up action movie star attempts to rebuild himself by being producer, writer, director, and star of a Broadway play. He is challenged with broken relationships, a feisty daughter, Broadway divas, and self-righteous critics. He battles with the questions I’ve posed. Were his old blockbusters art, or where they merely spectacle that road a trending wave to fortune? Did that give him value? Did it express something, or leave anything of meaning? And even if he has a successful play and can prove to the naysayers that he can act, will that give him value? There are hidden bits, hidden things; moments of magic not fully defined. But that is what makes you think and wonder. The actors are superb. The film required them to be. Acting within acting. Beyond the play within the film, the direction demanded acting. I would estimate that there were no more than 40 edits in the entire movie. Long scenes with moving cameras that follow character from dressing room to backstage to stage to backstage and costume change to stage again, creating unbroken chains that demanded a lot of the actors and cinematographers, and sound crew, and lighting crew, and everyone involved. These were not 20 second shots where the key grip can light a single spot and the director can tell the actor, “Here is your line, this is your motivation. Let’s shoot it.” I am certain that Keaton and Norton and all had to remember their lines and marks much the way stage performers do. The score is unique and brilliant. The story is quirky and inspired. The cinematography is crafty yet personal. A short warning, it is R due to language. It is not for everyone, and yet I think everyone should see it. Make of that what you will. Without question, worth the ticket. This entry was posted in Movie Reviews and tagged Art, Movie. Bookmark the permalink.